Pianist Shuann Chai holds degrees from Oberlin Conservatory, New England Conservatory (US), and the Royal Conservatory of the Hague (NL). Her first CD, featuring sonatas by Beethoven, was released in the Spring of 2011 by Postern Park Digital. Building a Legend: The Quest for the Original Sound of the First Steinway Grand. Produced and distributed by Paradigma Televisieproducties. 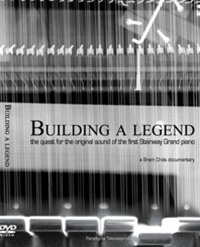 Building a Legend, a documentary short by Bram Crols (2007), chronicles the replication of the first Steinway grand piano, a six-octave instrument built by Heinrich Engelhard Steinweg in Seesen, Germany, in 1836. Also known as the ‘Kitchen Piano’ for its supposed assemblage in the kitchen of the Steinweg family home, the instrument was believed lost until 1930, when it was brought to the Steinway factory in Hamburg. Shortly thereafter, the piano was shipped to the Steinway & Sons storerooms in New York, where it quietly remains today. That would likely have been the end of the story were it not for the Belgian piano restorer and builder Chris Maene, who in 2004 expressed interest in making a replica of the instrument in what the film’s subtitle calls a ‘quest for the original sound of the first Steinway Grand’. The documentary begins with Maene’s first trip to New York in 2007 to meet with the great-grandson of H. E. Steinweg and to see the piano itself. Working together with his team from Belgium, Maene made detailed measurements of the original. In order to preserve the original state of the delicate 1836 Steinweg, much of the examination was conducted digitally and via x-ray, enabling the team to see the soundboard and the corresponding ribs without invasive procedures. While the film affords a compelling look at artisanal piano building, it leaves two major issues practically untouched. The first is the question of replication versus restoration: if the aim was to find the sound of the original Steinway, why was the piano replicated instead of restored? We are left to assume that the original was in too precarious a state to be used as a concert instrument. As such, is the sound of an instrument possible to replicate at all, given that the replication is done with the closest attention to original materials and dimensions as it was here? Pianists with the experience of having played both well-restored originals and copies understand that a well-made replica is, certainly, a good approximation of an old instrument, but between the two there remains a palpable difference in touch and in tone. Building a Legend treats the issue as a given — that if one replicates the dimensions and the materials one is replicating the sound itself — but it would have been more representative to have touched upon this discussion in the film. The second issue is of major concern to all pianists: is it possible to arrive at a historically informed performance by simply playing the repertoire on the time-appropriate piano? To what degree does the pianist matter, and what of his or her interpretive decisions? The film contains several conversations with El Bacha, who consistently enforces the idea that the instrument itself is the most significant factor. Footage of El Bacha practicing on a modern piano with paper cut-outs to cover the notes that would be ‘missing’ from the 1836 replica seems to suggest that the most noticeable difference between the two Steinways would be the smaller compass of the older piano. Even if that were the case, was it not an option for El Bacha to get to know the dimensions and sounds of historical pianos by trying other (widely available) pianos from the same period, whether originals or replicas, as the Steinweg was being prepared? A short discussion between Maene and El Bacha gives us some technical information as to how modern pianos differ from the 1836, but perhaps more interesting is El Bacha’s reaction upon playing the replica for the first time: ‘I find myself wanting to sing in every register … and often to play faster, pushed along by the response of the piano, which is probably correct’, he says (italics mine). For the record — literally — El Bacha’s modern piano recording of Chopin’s 1822 Polonaise is noticeably slower and heavier; but this remark is pivotal in its assessment of a stylistic element in the music that was physically and, in El Bacha’s view, directly, brought out of the performer by the faster response and the quality of the sound of the piano itself. Despite his apparent enthusiasm for the project, El Bacha’s reason for playing early Chopin (the aforementioned Polonaise (1822), among other works) on the 1836 replica is based upon the supposition that this early piano would do ‘justice’ to these works. Again, this comment begs the question of whether ‘justice’ can be done to any piece of music simply by using a historically appropriate piano. The most disappointing aspect of the film is that it misses the opportunity to take this discussion further by addressing aspects of performance practice and musical aesthetics, and how those issues could — and should — inform a pianist’s approach to playing a historical instrument. The implication, in this film, is that the piano is enough. Another missed opportunity in this film was the ‘casting’ of Malcolm Bilson in nothing more than a cameo role; shown only in a brief excerpt from one of his master classes and some scattered anecdotal footage, the acknowledged patriarch of historical pianos is noticeably underused. His conspicuously limited presence leads the viewer to wonder — without dismissing the artistry of El Bacha — whether and how the ‘sound’ of the first Steinway would have come across if Bilson, or indeed any other pianist familiar with historical instruments, had been at the keyboard. For whom was this film intended? The average viewer would have little or no idea about precisely why these old pianos are important and in which ways they differ — physically, sonically, and musically — from their modern counterparts. The purported ‘quest’ for the sound of the original Steinway is here relegated to the duplication of the piano alone while leaving aside the elements of pianism, interpretation, and performance practice. However, for an audience of fortepianists and other keyboardists familiar with the historical movement, the film clearly intends to bridge the gap between (modern) Steinways and fortepianos by emphasizing the forward-looking nature of this particular instrument, which it does very successfully. As a documentary of a replication project coming to life, the film is a pleasure to watch — however, it leaves more questions than answers in addressing whether the ‘original sound’ of a musical instrument can be replicated at all.